There’s always new lingo to learn – whether it is trending words or acronyms in social media, workplace jargon or even day-to-day living. If you decide to do a little decorating in your home and start searching online for ideas from paint colors to home design, you’re sure to run into unfamiliar lingo and concepts. One such concept used by designers is the terminology “warm” colors or “cool” colors when they are referring to home décor. Well, did you wonder about this terminology and whether warm or cool colors would enhance your home? Well, if you’re curious, then read on to discover what color theory means. If it is difficult for you to differentiate between the concept of “warm” versus “cool” colors, simply begin by thinking of warm colors as resembling a fire (thus you are warm) as opposed to cool or cold colors which resemble sky, ice or water, (the latter which make you feel cool or cold). The colors in the raging fire in your fireplace consist of orange, red, yellow or combinations of these colors. Your familiarity with these colors in the fire make you think of sunlight and heat. Warm colors look as though they come closer, or advance toward you (as do dark colors), thus, when used in conjunction with paint shades, they help to make a large room look cozier. For example, if you have a huge study that has always been painted in darker hues and perhaps has dark wood furnishings, the room does not look inviting and cozy, but, if you were to paint it a natural color, like terra cotta for instance, the room instantly becomes more intimate and cozy-feeling. Cool colors cull those shades like white, blue, green and light purple from the color wheel. These particular colors have the ability to calm and soothe us. You probably know that most hospitals are painted in any of these colors, particularly light green, to provide as stress-free of an environment as possible. Cool colors remind us of water and sky, and have the ability to appear as though they recede, making them a good choice for small rooms where you desire the room to appear larger. Painting a small bedroom or tiny bathroom in a color like light blue is guaranteed to make it appear more spacious. But, what if your rooms are neither large nor small? How does one create balance and harmony in the interior of the home using the art of color theory? Designers suggest that you should create balance in every room, which means that if you wish to create coziness, do use warm colors, but incorporate some cool colors in your accessories. Likewise, use cool colors to create a larger-looking room with subtle warm color touches added for balance and contrast. Remember to always choose colors to create the mood you wish to instill in your home and knowing the difference between warm and cool colors is your first step. Consulting with a top house painter in Summit, NJ can help solidify your decisions about the proper colors to use. Above, you’ve learned how to create certain moods in your home as well as how to make each room look smaller or larger. A professional painter is one who is skilled in understanding the concept of utilizing paint colors for room sizes. He or she might suggest that the warmer colors in the spectrum (orange, red and yellow, or those colors tinged with red) will absorb the light, thus “cozying up” the room. Also, while an expert house painter can enlighten you on how light colors such as white, cream or pastels can enhance your space, he or she will also tell you some tricks of the trade, such as the use of high gloss paint to additionally expand the space in the room. 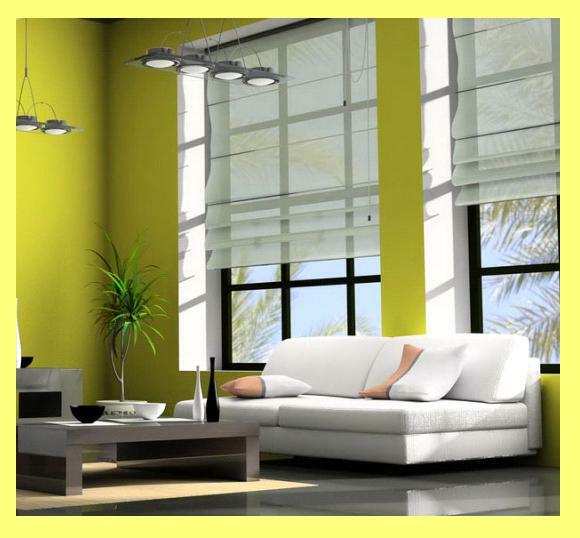 And did you know that walls will appear taller by painting some of the ceiling the same as the wall color. This will create a six-to-twelve-inch border where the wall meets the ceiling. You can create space with stripes and make a small room appear like a grand-sized room. Vertical stripes will enhance the height of the room by drawing the eye upward and away from the perimeter of the room. If you have no need to use paint color to alter the size of a particular room, then perhaps you’d like to just hone in on using a paint color specifically for what the room is used for, i.e. a palette of muted tones like pale lavenders or wispy blues are perfect for creating a Zen-like feeling in the bathroom or bedroom, and sunny yellow, long the primary color that has adorned the walls of many a kitchen through the years evokes happiness and familiarity – what better way to describe the folks around your dinner table than those most familiar to you… your family and friends. By understanding the concept of warm and cool colors and confidently choosing the colors for the particular rooms in your home, you alone, without the use of a design consultant, will have the ability to use that knowledge to pick the perfect personal color schemes going forward.